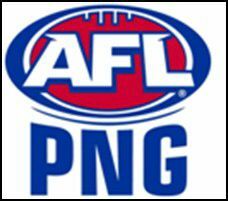 Across the weekend of November 9-11 the AFL PNG Coca Cola National Championships were concluded in the cities of Lae and Kimbe. In Lae, the Southern, Highlands and Northern regions gathered with age groups across Under 13, 15, 17 for boys and Under 17 for girls playing off in a series of matches leading to selection in 2013 national squads as well as competing for the Coca-Cola Shield, awarded to the best performed region both on and off the field. The Islands region held their championships in Kimbe the following week (Nov 17-18), due mainly to transport difficulties. AFL Asia Pacific Development officer Ben Drew and AFL PNG GM Murray Bird worked with the Islands officials to hold a series of matches that allowed for the inclusion of boys and girls from the Islands region to the national squads. 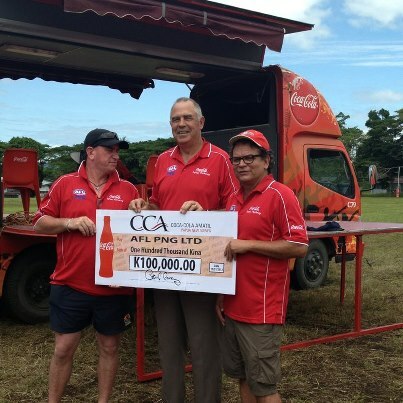 During the carnival, Coca-Cola Amatil General Manager, Peter Carey called in to present a sponsorship cheque to new AFL PNG General Manager – Murray Bird. Coca--‐Cola Amatil have sponsored AFL PNG programs for over ten years, and Mr Carey announced at the carnival that Coke would be extending that relationship until the end of 2014. Coke has increased their commitment to Australian Rules football to $150,000 kina per annum between 2012-14. Selections have been made for the Under 14 and Under 16 Binatang teams to travel to Australia in 2013. Selections for the Under 17 Girl’s Kurakum team; Open Women’s Flames team; and Under 18/19 Kapundas, will be announced prior to Christmas. Australian Scholarships and 2013 Academy intake will also be announced in the coming weeks. Also note that Peter Carey is the SANFL Hall of Famer and former Glenelg champion. Murray Bird is a former AFL Umpire and long time administrator and many years ago a junior teammate of Jason Dunstall at Coorparoo.